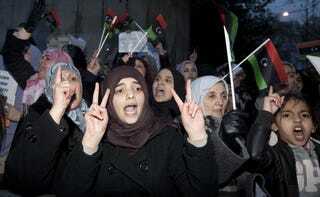 The Washington Post is reporting that fresh protests have erupted across the Middle East and North Africa. Embattled leaders in the region struggled to contain their discontented masses, deploying a wide variety of tactics — from offers of dialogue to brutal crackdowns — to suppress the pro-democracy forces unleashed by the revolts in Tunisia and Egypt. Amid deepening protests in the past few days, the Libyan government's grip on Benghazi, the second-largest city, appeared to be slipping. Security forces there opened fire on mourners attending funeral marches for 84 protesters killed the day before, their harshest response yet to the recent round of demonstrations. They also swiftly clamped down on smaller uprisings that spread to the outskirts of the capital, Tripoli, where protesters seized military bases and weapons. The outbreak of protests there signaled a new threat to the regime. Protests also broke out Sunday in Morocco and Tunisia, posing new challenges to their rulers, while authorities in Iran and Bahrain continued to confront calls for reform. By late Sunday, the number of those killed in the uprising across Libya had soared to at least 233, most of them in Benghazi, according to Human Rights Watch. Other news reports placed the death toll at 200 or much higher. It is being reported that Libyan leader Muammar Qaddafi has said that the government will fight against protesters until the last man is standing, while others believe they are headed to civil war. What will the U.S. do then? How will we continue to overlook the increasing violence against Libyan protesters? Can we really be allies with countries that open fire on citizens pursuing democracy? In other news: Dave Duerson: Death Ruled Suicide; Donates Brain to Science.